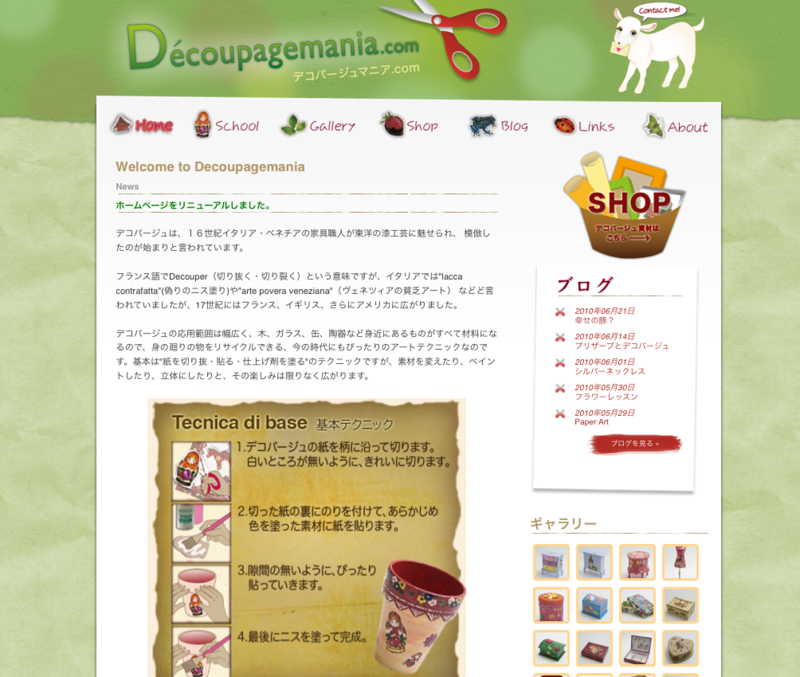 Decoupagemania is the one-stop shop for learning about decoupage in Japan. Decoupage is a decorative technique where standard objects can be transformed into beautiful objects of art using quality paper which is cut and glued in special patterns on the object. The paper is often imported from Italy, where the decoupage technique was first used. The project consisted in setting up the server environment and CMS, coding templates, coordinating design and content, and setting up a small online shopping system through a online shopping cart service. No previous website was available, and therefore the site had to be completely built. ExpressionEngine was chosen for its extreme flexibility, ease of use, and potential for future website growth. Content managers, who had tried and were familiar with other CMS and publishing systems in the past, were very pleased with the ease of use of ExpressionEngine.